“We are being hurt,” says Ustad Alimondas Laut, holding back tears. Sad stories aren’t the usual markers for the end of Ramadan in the Philippines. For Filipino Muslims, festivities generally denote the end of Ramadan. The government declares this day, which falls on June 26 this year, a nonworking holiday across the country. On May 24, just a few days before the beginning of Ramadan and a few hours after Mindanao was placed under martial law, the military and the mayor ordered residents of the besieged city to evacuate. Laut, who was in downtown Marawi then, immediately called his family to prepare for the move. Residents were given a six-hour window and a threat of reprisal if they didn’t leave. Later, his entire family and some neighbors were crammed into a small jeepney, headed for nearby Iligan City. Laut and his family are now in a relative’s house in the Lanao del Norte capital. He says he’s far luckier than many other evacuees, or internally displaced people (IDPs). He is right. Some 7 percent of the IDPs are in government-designated evacuation centers. These locations are now crammed and untidy. People are getting sick; infants are reported to have died. Explosions in Marawi could be heard. The other 93 percent are staying in unregistered locations, like other people’s homes. These individuals are a hidden humanitarian crisis. Home-based evacuees are an unaccounted number of unserved or underserved IDPs. Most relief assistance is distributed at evacuation sites. Homes, businesses, and other buildings have been damaged or entirely levelled. Some were Moro and Christian historical and cultural treasures. Many residents didn’t make it out on time and are now caught in the crossfire, alerting those outside the battle grounds only through text messaging. 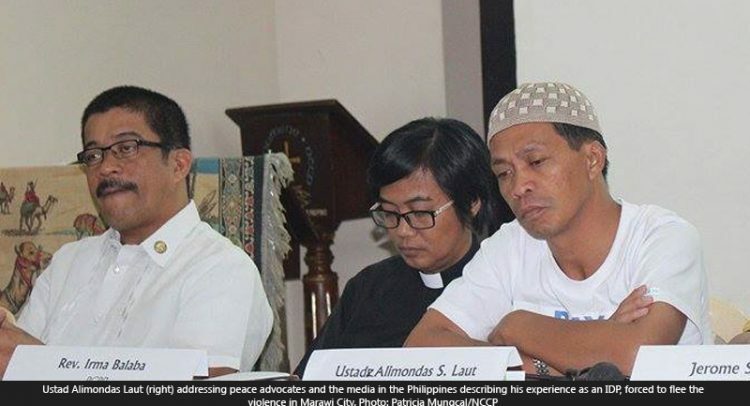 Since hostilities broke out in late May, only the eight-hour Eid’l Fitr ceasefire was a respite. With Marawi still shrouded in unrest, meantime, displacement is foreseen to escalate. Government units and agencies are now exhausting their resources to deliver initial relief services to the evacuees, but the need is increasing by the day. There is still a desperate call for food, drinking water, kitchen utensils, clothing, sleeping materials and temporary shelters. The IDPs also have unaddressed psychosocial and overall-health needs. The conclusion of Ramadan signals greater demand – and opportunity – for aid. ACT members are working to meet that demand by providing immediate assistance such as food, water, sanitation & hygiene kits & facilities, non-food essentials, and unconditional cash grants, while, looking toward post-crisis interventions through livelihood support and shelter repair materials. Psychosocial support is also an identified need not only for children but for all the members of the IDP families staying in homes or in evacuation centers near Marawi City.